Thread: This trailer has Tecster written all over it! I wonder what type of tongue it has? Id be afraid that it would tip on a corner if it had a regular one? Other than that it's such a simple idea and there are so many benefits! Storage? Put a clamp on tripod base on it.....stand it up on the wheel and attach a basketball hoop/backboard.....perfect camouflage! All it would take would be a double pin pivot style mount. 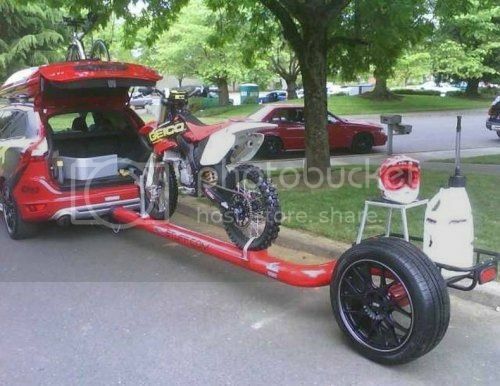 Getting anything other than a dirt bike on that would be a huge pain in the junk. Even getting a dirt bike on a tube (not a square) would be difficult I think. While it looks cools and has the possibilty for a unique storage method, I'd rather just have a traditional folding trailer. Looks cool. Not for me, though. I assume this was taken at the NJ supercross? FS:(CT) Pit Bull Trailer Restraint + HB foldable trailer.